That will be excellent! Looking forward to it, for sure! Welcome! I don't think I've seen an F1 Vorpanzer before, so this will be a bit of a learning experience for me. I'll also be interested in seeing how that kit goes together. More often than not, I find myself turning to Dragon for armor than anyone else. I have built the 'E' Vorpanzer. Can be a bit tricky in places but not that difficult. Not sure if the F1 Vorpanzer was at Stalingrad, I know that an Ausf E was with Panzer Regiment 31, in the 5th Panzer Division but they went to Moscow after Greece. Close enough to be in the build I say!! More often than not, I find myself turning to Dragon for armor than anyone else. This will be my project for this Campaign. You are correct about the F1. The additional armor was not added until after January 43 by Hitler's order. 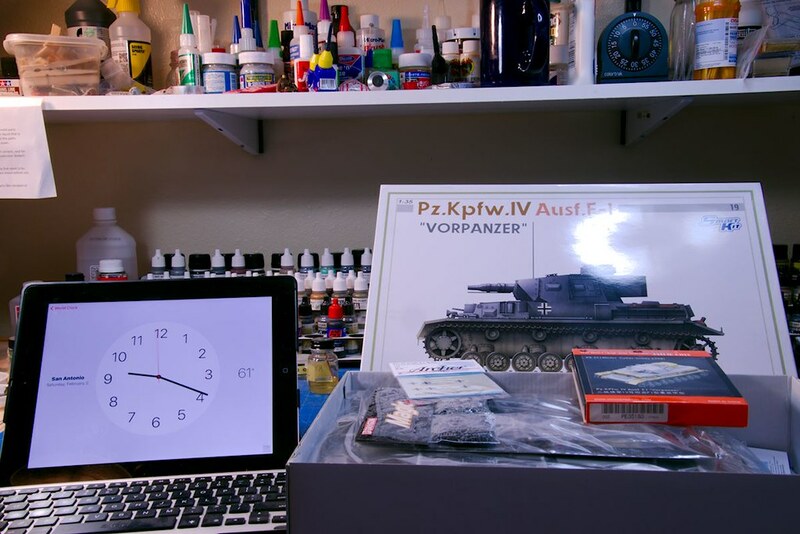 What I didn't mention in my intial post is my plans on building Pz IV without the additional armor with the tank assigned to the 14th Panzer Div. I have several reference photo's of them approaching Stalingrad. One nice thing about most Dragon kits is they always give you options on how you can build out your kit and leave you with a lot spares to use on other builds. Mark-Looks like it'll be an interesting build. Looking forward to following your progress. I will be dropping out of the campaign. I just found my club's contest schedule for 2019 and Stalingrad doesn't fit into the schedule. 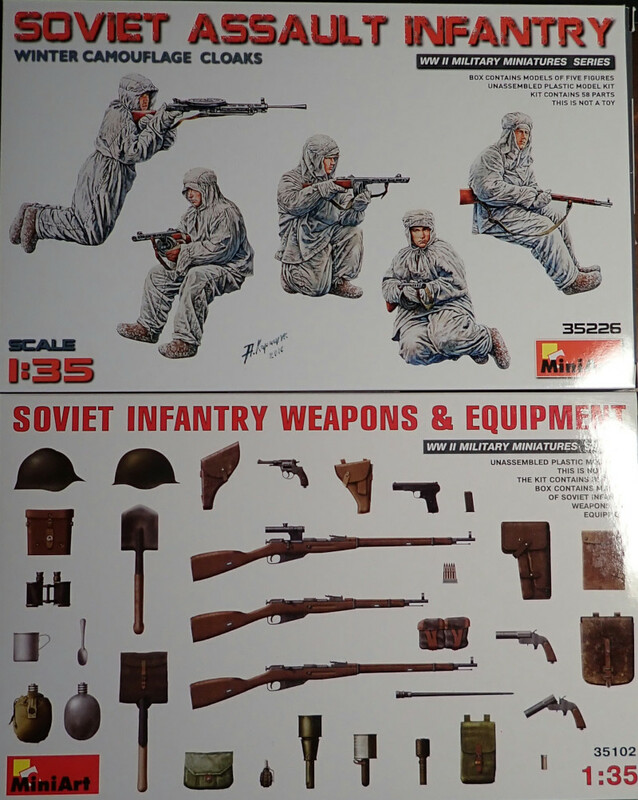 I just finished reading "Stalingrad" and was planning to start my build. Are sook and masochist the same thing? You are too uber, Peter. Maybe you should propose a Bronco campaign. Then I'll get one for sure. Welcome! I like the look of your Sturmovik! Glad to see some Russian gear popping up early. I'll make sure my T-34 has an aerial recognition triangle on the turret. NO worries, Don! We'll catch you on another campaign in the future! Is the BMW R75 / Zundap R750 were involved into Stalingrad? I think it's safe to say that they were everywhere. So.. I will start one in one of the next week/days. Some nice starts and interesting topics already! 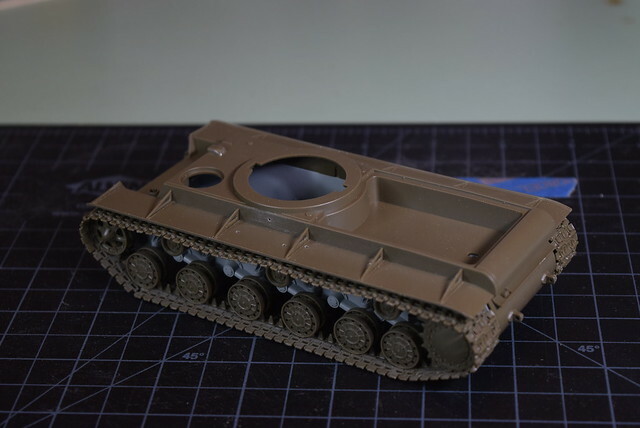 I've begun my KV-1, 1/48th scale Tamiya with a Finemolds brass barrel. Otherwise this will be out of the box with no extra, but possibly a winter camo job. It's going together quite smoothly as this is only a couple evenings worth of work. So far the greatest effort is sanding out the ejector pin marks from the fender stays and the lower tracks. The tracks are halved to remove for painting and the upper hull is only dry fit. Are those individual track links? If so, impressive. I'm playing with individuals for the first time with my Mark III and it's taking me a lot longer then a couple of evenings. Here's my first update, and first time posting images on here so bear with me. You can see the matching bases, and I'm going for a sort of before and after theme that I've been thinking about for awhile, then I found two of the perfect matching bases for my idea. I also want to show the contrast from the perspective of the Germans. 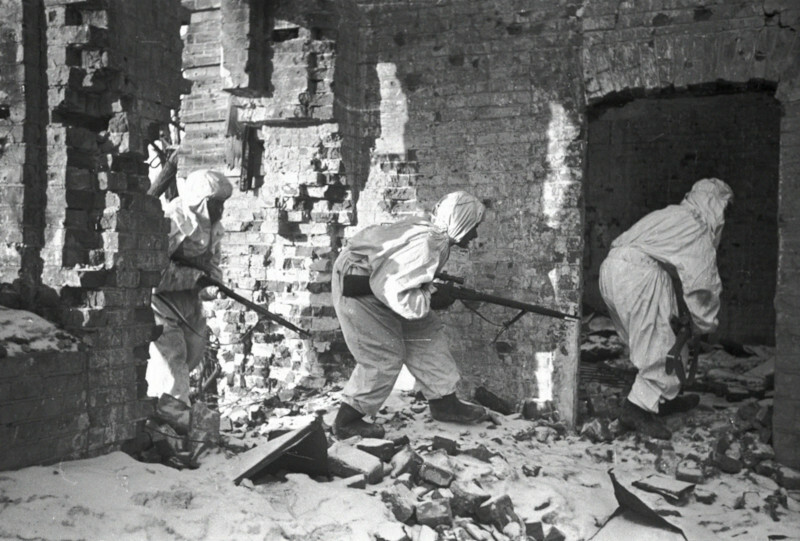 Starting with the advance to Stalingrad, the success and as well as the overall arrogance that the Germans had as a whole during their successful summer offensives and then you have the opposite, the destruction and surrender of the 6th Army at the hands of the Soviets, which through unprecedented endurance and the ability to adapt and implement new weapons and tactics allowed them to hold off and eventually defeat the Germans. Then following Stalingrad almost seemed to be this unstoppable force rising from the rubble of Stalingrad which was tasked with taking back what was once theirs. Or something along those lines, I'm no Hemingway so you can color that passage up how you like. I wanted a sloped rubble pile to work with, showing a T34 sort of puffing out it's chest a top of it's own ruined home, sort of taking a breath before continuing on to take back it's country. I'm using part of Verlinden's German Govt ruin for a small ruin here. Another portion from the German Govt ruin, with sandbags where I'm going to put an abandoned German fighting position. Bag's where made with milliput and painted Tamiya Dark yellow, which I think I didn't mix well enough, so I'll add another coat on. I don't like how the red of the bricks came out using Vallejo red so I'll likely touch those up. The very beginning stages of the Mark III base. Ignore the figure, he was just there for reference to how high to make the fence. I'm scratching building this fence, found some old plastic wood planks, not sure from what but the backside was smooth so I rubbed sandpaper across it to rough it up, the bottom plank was added because there's gonna be a little piglet in the pig pen, figured the farmers would want the bottom portion covered to prevent any escape. Pathfinder: the tracks are length and link with the top and bottom being single pieces, 3 sets of double link around each drive and idler, and a 5 link runner for the sloped bit, with only two individual links blending in the slopes. I think if they were all individuals it would not look nearly as nice, and I probably would have shot myself somewhere along the way! Also, nice work on your diorama. Looking forward to seeing it completed. 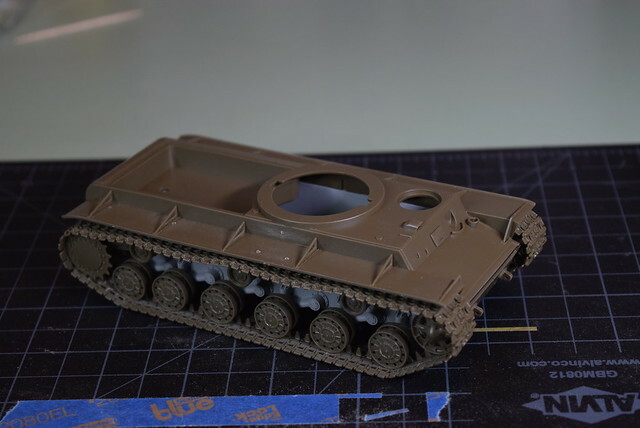 Are those road wheels on your T-34 workable or do you have them posed? Unfortunately the running gear isn't workable. All I've done to get them free is to cut the locator pin at the rear of each idler arm to allow it to pivot. I'm using blutack to hold them in place at the moment. 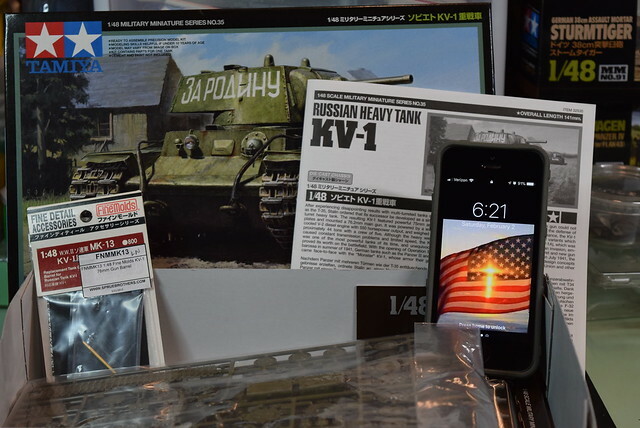 Great start on your KV-1. Took me a minute to realize it wasn't 1/35. Pathfinder, looks like some interesting plans you have for your dioramas. Looking forward to seeing it come to fruition.